Even the most experienced growers can confuse weeds from time to time. 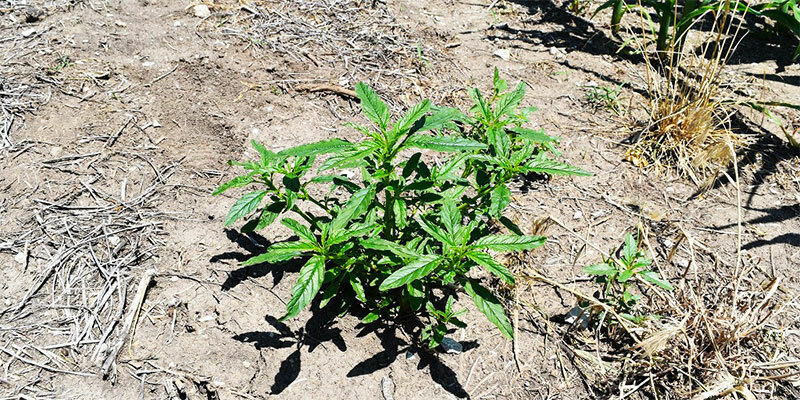 Different types of pigweeds can look similar, and misidentifying weeds can have repercussions for weed management and crop production. Waterhemp and Palmer amaranth are 2 of the most common yield-robbing weeds corn and soybean growers face today. These 2 pigweeds can be found in almost all corn- and soybean-growing regions in the U.S., and are often misidentified. Palmer amaranth has also been spreading northward and can be found in more counties this year. This Weed Science map shows resistant weeds found in every state. The University of Nebraska-Lincoln has 2 tips to help differentiate these species. It’s important to note that it becomes even harder to properly identify waterhemp and Palmer amaranth when they are allowed to mature in fields and reach the flowering stage. Palmer amaranth cotyledons tend to be longer and narrower compared to those seen on waterhemp. True leaves on Palmer amaranth will be notched at the tip; little hairs are less common on waterhemp seedlings. Both of these weeds have the ability to produce and spread hundreds of thousands of seeds if not properly managed. When allowed to mature, this can escalate resistance in fields and reduce overall crop quality and profits. While many herbicides are labeled for a number of common weeds, it’s important to know exactly what’s in your field in order to create an effective weed control program. This is especially true as resistant Palmer amaranth continues to spread. Programs with multiple effective sites of action will result in the most complete control of labeled weeds. Thankfully, the herbicide strategy for controlling Palmer amaranth and waterhemp is the same. Use a program with multiple effective sites of action. In corn, that means a 2-pass application system of Acuron® or Acuron Flexi herbicides. When used as a pre-emergence herbicide, follow with Halex® GT herbicide plus atrazine or dicamba. In soybeans, a pre-emergence application of Boundary® 6.5 EC or BroadAxe® XC herbicides is a great foundation that can be followed by Flexstar® GT 3.5 herbicide. Test your weed IQ knowledge with our short quiz and learn more about our Resistance Fighter program.